Special thanks to Norvil Leary Brown: (Para. 3.b.(4.(f.(2)(d)[3. of the Van Patten Annex), who compiled the information in this annex. Born 1620-30 in the Netherlands. Died at Albany, New York. In 1653 immigrated to New Amsterdam (now New York City) aboard the sailing ship King Solomon. Employed there as a clerk and school teacher. In 1661 moved north to Albany, where he served as an Alderman and as Albany's Treasurer. a. Martina/Martha Becker: Married William Hooge/Hogan. b. Johannes Becker: See generation 8, below. Born about 1672 at Albany, New York. Died . Born . Died . Married Johannes Pieter Becker on 17 December 1684 at Albany, New York. b. Hilletje Becker #1: Born/baptized 23 January 1689 at Albany, New York. Died young. c. Johannes Becker, Jr.: See generation 7, below. d. Hilletje Becker #2: Baptized September 1693 at Albany, New York. Perhaps married Henderick Van Wie. e. Storm Becker: In 1724 moved to Schoharie Township, Albany County, New York. f. Gerritt Becker: Born 1698.
i. Annetje Becker: Born 1706.
j. Pieter Becker: In 1724 moved to Schoharie Township, Albany County, New York. Born/baptized 4 August 1691 at Albany, New York. Died . Born . Died . Married Johannes Becker, Jr. on 14 October 1714.
d. Pieter Becker: See generation 6, below. Born 31 December 1721 at Albany, New York. Died . In 1724 moved to Schoharie, Albany County, New York. Resided last in Sharon Township, Schoharie County (created 1795), New York. Born 6 March 1764. Died . Married Pieter Becker on 22 June 1760. (1. Johannes Pieter Becker: See generation 5, below. Born 9 May 1762. Died . Resided last in Sharon Township, Schoharie County, New York. Born 6 March 1764. Died . Married Johannes Pieter Becker on 15 February 1785.
a. Mary Becker #1: Born 4 June 1785. Died 13 November 1793.
b. George Becker: Born 22/24 August 1787.
c. Peter D. Becker: Born 4 June 1790. In 1849 resided at Decatur, Green County, Wisconsin. In 1852 resided in Porter Township, Rock County, Wisconsin. d. Mary Becker #2: Born 1 February 1794. Died 28 February 1794.
e. Henry Becker: Born 3 November 1797.
f. Allen Becker: Born 27 May 1800.
g. Adam Becker: See generation 4, below. h. Nancy Becker: Born 22 May 1806. Married (?) Folsom. Born 4 January 1804 in Schoharie County, New York. 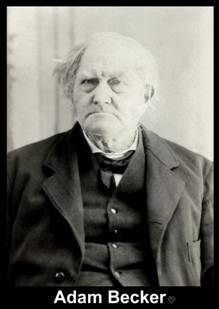 Died 31 Dec 1888, age 84 years, 11 months, 4 days at Nunica, Michigan. Married Hannah Van Patten, paragraph 3.b. (4 of generation 4 of the Van Patten Annex on 13 October 1826 in Brownville Township, Jefferson County, New York.